Most companies don’t last 10 years, and only a fraction make it to 20. For Trendway, 2018 marks 50 years of building beautiful products and delivering them with outstanding service. We think this is cause for celebration. Join us this year in celebrating Trendway’s 50 years, we’ll be looking back, but also looking to the future. As we move into the new year we will continue our mission of making speed and ease the defining experience for our customers by simplifying the process of creating beautiful spaces and delivering them on time, every time. Founded in 1968, Trendway began manufacturing a new gypsum-based wall panel that offered higher fire resistance and better sound rating than any other partitions available at the time. When the Heeringa family took over in 1973, the business was struggling, but Don Heeringa held the company together through his commitment to service. Service to his employees, customers, and community was the philosophy he led with. Today, 50 years later, Trendway continues to offer a unique combination of quality, service, and unmatched responsiveness that sets us apart. Throughout Trendway’s history, we have been committed to taking care of our employees. We believe this is one of the best ways to provide exceptional service to our customers. Trendway is fortunate to have numerous employees who have devoted over 30 years of service to the company and our customers. For our 50th anniversary, we are recognizing these employees and sharing some of their stories. Click on the images below to read their stories. Trendway CEO and Chairman Don Heeringa leads the 30+ Club with 45 years of working for and leading Trendway. Don joined Trendway 5 years after his family invested in the company. He has spent the last 45 years encouraging and watching the company grow alongside its employees, helping people develop new skills to take on better and more challenging roles within the company. Don feels very fortunate to work in a community where there is such a wealth of hard-working, talented, and dedicated people. "I am especially proud of Trendway's record of serving many charities and community needs over the years. We certainly are not the largest in our industry, but Trendway people have the biggest hearts when it comes to meeting community needs and serving their fellow man." Lon Lundy has been with Trendway nearly from the beginning. He started out preparing steel parts for painting in our manufacturing plant, and now works in product design for architectural products. Lon was influenced and encouraged to grow within the company by Tom McAfee and Don Heeringa. He is grateful for the opportunity to work in both the manufacturing and office settings, meeting a wide variety of people and building lasting relationships over the years. Lon's most memorable Trendway experiences range from a lobster lunch as a thank you for a quick project turn around, to a train running through one of our trucks and depositing TrendWall a quarter mile down the tracks. After 44 years at Trendway, Lon has seen it all. Barb Jones places high value on loyalty and has been a loyal employee of Trendway for 40 years! She worked in a variety of manufacturing departments and positions throughout the years, always willing to go wherever she was needed. Barb now works in order processing and says that she and her coworkers, both past and present, "have not only become friends, but family." One of Barb's favorite Trendway stories was when the roof caved in from snow in the original manufacturing area and made the sprinklers go off in the offices as well. "Seeing all the guys in their suits running around with their pants rolled up, no socks, no shoes, was something I will never forget. They worked hard to take buckets of water out of the office." John Dinger has been part of Trendway for 39 years, growing alongside the company throughout the years and having the opportunity to meet and work with a variety of wonderful people. One of the reasons he decided to stay with the company for so long is the culture of caring. Trendway has always made caring for its employees, their families, and the community a priority. John has had many memorable Trendway experiences over the years, but one of his favorites is installing two truckloads of panels on the fifth floor of the Meijer Headquarters in Walker, MI. "Our panels were too tall to fit in the elevator," says John, "So we had to go outside and load each panel onto a scissor lift to the fifth floor, where we unloaded them through a window!" Terry Arens has seen a lot in his 37 years with Trendway. He started out doing yard work for Don and Jim Heeringa and sweeping floors at Trendway, and now works as a Manufacturing Technician. Trendway is where he met his best friend, Mark VandeBerg, and where he learned about Relay for Life. Terry participated in Relay for Life through Trendway for a number of years. Terry and the rest of the Trendway team would join many other individuals and organizations at West Ottawa High School and relay walk for 24 hours to help raise money for The National Cancer Society. Sandy Brunmeier started her career at Trendway working in shipping and is now a Buyer/Planner II with the purchasing team. In 1990, Sandy went through some difficult times and confided in Marlene Serne, Director of HR, that she was considering leaving Trendway. Marlene instead sat her down and talked to her about what was wrong, helping her work through her troubles. "That was when I really realized that Marlene and Don truly cared about the families of Trendway employees," said Sandy, "And I knew then that Trendway was a company I wanted to be with for a long time." Sandy is an active participant in many of Trendway's charity campaigns, including luncheons for employees on medical leave, preparing dinners for Hope Lodge, and volunteering at Cruise-In. Sandy has been largely involved in Trendway's annual Cruise-In Benefit since its inception 16 years ago, "I participate in a lot of charity events through Trendway," says Sandy, "but Cruise-In has always been my passion." For Russ Burley, working at Trendway has been all about the people he has had the opportunity to get to know, and the leaders who have influenced him and made Trendway the successful company it is today. Russ might have started out as a second shift temp, but throughout the years, he has held various positions within the company and is now the Program Manager of Strategic Initiatives. "I have learned a lot not only from Don Heeringa and the other leadership team members whom I worked for, but also from the people I managed and all the coworkers I worked with over the years." Sandy Sikkel began her Trendway career in Accounting and currently works in Customer Care. Her favorite part of working at Trendway is her work family, "My work family has changed over the years, but I have a lot of lasting friendships formed at Trendway." She is thankful for her mentors, Doug Dinkins and Sue Kammeraad, who encouraged her to grow within the company. Sandy's favorite story is when Trendway participated in the Community Games, which was a friendly competition with other companies in town. "I'll never forget the team theme songs that Loran DeFeyter would write and perform," says Sandy, "especially 'Bad to the Bone', which was performed in skeleton costumes." Patti VanderHulst started working for Trendway right after the company invested in their first computer system. She remembers having to manually enter inventory information and update by hand as each item was later removed. She actually handwrote the order acknowledgements that were mailed to Trendway customers. She is now Trendway's GSA Contract Specialist, and quite thankful that technology has come a long way since then. Patti was involved with Trendway's first Angel Tree charity and has continued her support ever since. She worked with Kathleen Wallis for many years to deliver presents to foster children in Ottawa County. "It was so special to deliver all of the presents, knowing that all of the children would have such a wonderful Christmas." Patti is proud to work for a company that has provided so many opportunities for employees to serve the community. Cal Havinga has worn many hats in his 33 years with Trendway. Starting as a truck driver and then a Field Service Technician, he later moved to customer services as a Product Support Specialist, and most recently as the Installation Manager. "I have enjoyed the years working in the truck and field service," says Cal, "and all the relationships I have built with Trendway dealers, reps, and end users in Customer Service helping my team and serving our customers." In his new role, he'll lead the installation team setting up the offices that our customers love. Many of Cal's most memorable Trendway stories come from his days as a truck driver. "One time, Trendway volunteered the use of their trucks to bring loads of hay to drought-stricken areas. Gord Bruins and myself teamed the truck to Maryland. Other times I also delivered water and clothing donated by the community." Cal's daughter Jena was a recipient of the George and Lucile Heeringa Scholarship, and he has always been very appreciative of how Don Heeringa and Trendway have taken care of him and his family. Tim Scheafer has enjoyed the challenge of moving through different jobs and departments in the 31 years he has been with Trendway. Working in so many different areas has allowed him to meet many hardworking and caring people and really feel like part of the Trendway family. Tim has also enjoyed knowing that he makes a difference here at Trendway. Tim drove back and forth between Chicago and Holland delivering parts when Contrada first launched and was being shown at NeoCon, "I was proud to be able to help make the showroom the best it could be." For Harold Brezina, the last 30 years have flown by, "I like my job and all of the people that I have worked with in my time here. When I first started at Trendway, I was eagerly welcomed into the family and before I knew it 30 years had gone by!" 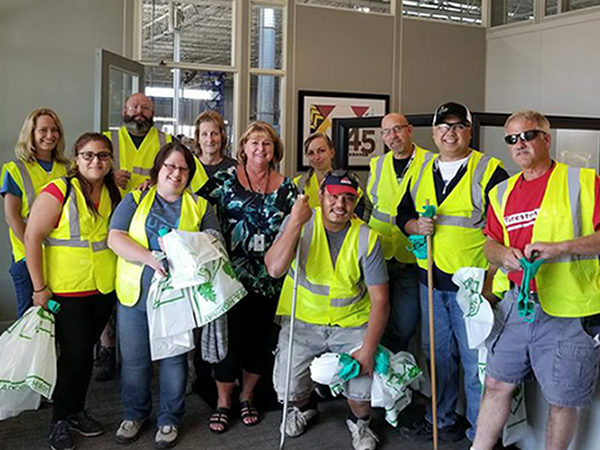 Harold has participated in many of Trendway's volunteer and charity events, including walking in Relay for Life to raise money for The National Cancer Society, and helping keep our highways clean through Trendway's participation in Michigan's Adopt a Highway campaign. Trendway is founded. Movable walls and partitions are the principal product. The Heeringa family purchases Trendway and turns the struggling business around. Trendway purchases the floor-to-ceiling business component of Modern Partitions (Haworth), further growing the movable wall business. Trendway enters the office systems market with the introduction of Space Management Systems. Trendway's new SMS Express quick-ship program is the first and the fastest in the industry. Trendway introduces the new Choices System, a product that has evolved to become our best selling systems product. This is also the year Seating is added. The manufacturing facility is expanded and Trendway earns the ISO 9001 certification. Manufacturing facilities are expanded to house the growing Seating operation, maintaining all operations under one roof. On Time or On Trendway is introduced, continuing Trendway's reputation as a fast and reliable company. Intrinsic Freestanding joins Trendway's expanding line of products. This new casegood line quickly becomes a top seller. Trendway greatly broadens its product offerings with the launch of Volo Wall, Capture System, and Feek. Trendway adds Plus Soft Seating and Confer Benching. Coinciding with our 50th Anniversary is the Trendway Give 50 Challenge, a companywide initiative that encourages all employees to participate in 50 hours of community service throughout 2018. As part of the Challenge, employees may volunteer for traditional Trendway charities like Hope Lodge, our annual Cruise-In Benefit, and Angel Tree for foster children in Ottawa County, or choose relief efforts, environmental stewardship or any charitable cause the employee supports.